A non-sagging, firm, extremely flexible adhesive/sealant used for sealing vertical and horizontal seams and joints on automobiles and trucks. Can be used to reinforce and eliminate flutter and vibration of body panel cross members. Excellent for pickup beds and around hinges. Excellent adhesion to: bare metal, primed metal, SMC, FRP, fiberglass, aluminum and most plastics (for TPO and Polypropylene plastics, use #4182 INTER-BOND Adhesion Promoter). Our automatic mixing system eliminates errors which are common in manual mixing. Dispenses with IES 300ml cartridge applicator guns #96212, #96215. Can be sprayed with our 2K Spray System! WORKING TIME: 15 - 20 MIN. HANDLING TIME: 20 - 30 MIN. A fast setting, firm yet flexible automotive seam sealant. Material skins in approximately 1 minute. Can be painted in 20- 30 minutes. Sets to a firm yet flexible consistency with tremendous adhesion. Will not peel or crack. Seals wet or dry. Can be smoothed to a fine feathered edge, even after it has skinned, by using IES #1700 or #4700 Super Cleaning Solvent. A permanently flexible polymeric-based seam sealer formulated to duplicate OEM brush lines and beaded seams. Paintable and has excellent adhesion to metal, galvanized steel, rigid plastics, fiberglass and aluminum. Contains no silicone. Do not use for windshield or back-glass installations. CAUTION! Do not use solvents for tooling or feathering the seam sealer. This may damage the seam sealer, keeping it from curing. A permanently flexible polymeric-based seam sealer formulated to duplicate OEM brush lines and beaded seams. Paintable and has excellent adhesion to metal, galvanized steel, rigid plastics, fiberglass and aluminum. Contains no silicone. A thumbable, easily tooled caulk. Seals cracks, seams, joints, housings etc. Will not dry out. Remains fl exible. Seals out moisture, air and dust. 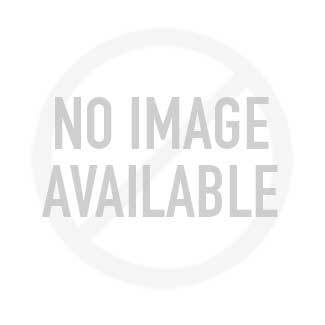 Paintable immediately. Super feathered edge. A fast setting, permanent flexible sealant. Used for sealing vertical and horizontal seams and joints on automotive and truck floor pans, trunks, firewalls, lap seams, etc. A permanent, flexible, all purpose automotive sealant for autobody drip rails, seams, cracks and joints. Can be smoothed to a fine feathered edge, even after it has skinned, by using IES #1700 or #4700 Super Cleaning Solvent. A permanently flexible polymeric base sprayable seam sealer formulated to duplicate automotive OEM coarse textured and beaded seams. Paintable and has excellent adhesion to metal, galvanized steel, rigid plastics, fiberglass and aluminum. Contains no silicone. A superb rigid adhesive, filler and resurfacer. Adheres to metal, aluminum, fiberglass, most plastics, urethane, SMC, glass, wood and concrete. Resistant to gasoline, acid and solvents. Our automatic mixing system eliminates errors which are common in manual mixing. Dispenses with IES cartridge applicator guns #96200, #96216, #96212, #96215. WORKING TIME: 5 - 10 MIN. SANDABLE/PAINTABLE TIME: 10 - 20 MIN. HANDLING TIME: 10 - 15 MIN. A permanently flexible polymeric-based seam sealer formulated to duplicate OEM brush lines and beaded seams. Paintable and has excellent adhesion to metal, galvanized steel, rigid plastics, fiberglass and aluminum. Permanently flexible. No shrinking. Holds brush lines. Contains no silicone. A permanently flexible rubber base sprayable seam sealer formulated to duplicate automotive OEM coarse textured and beaded seams. Paintable when cured and has excellent adhesion to metal, galvanized steel, rigid plastics, fiberglass and aluminum. Contains no silicone. Firm & Flexible Clear Automotive Seam Sealer is a fast setting, firm yet flexible clear sealant with excellent adhesion to most surfaces. Can be smoothed to a fine feathered edge, even after it has skinned, by using IES #1700 or #4700 Super Cleaning Solvent. BEAD-IT is a black, thick-set, firm but flexible epoxy compound that can be applied to various surfaces such as: bare metal, primed or painted surfaces to help deaden sound and seal seams. Using IES's New Spreader Nozzle Applicator many of the bead patterns can be made effectively and efficiently. BEAD-IT comes in a 300 ml cartridge with three static mixing tips and may be applied with a manual, pneumatic or battery powered gun. The New Spreader Nozzle Applicators are reusable and are sold separately. Duplicates OEM Sound Deadening Beads & Patterns! Can Be Applied To Bare Metal, Primed Or Painted Surfaces! 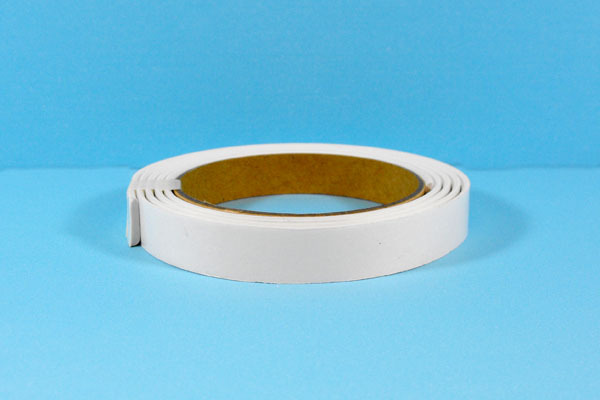 A thick set, non-sagging, firm, semi-flexible bare metal adhesive / seam sealer. Designed for sealing vertical and horizontal seams and joints on automobile and truck applications. May be applied to bare metal and primed sheet metal joints. Excellent adhesion to: bare metal, primed metal, SMC, FRP, fiberglass, aluminum and most plastics. Features corrosion inhibiting chemistry. Passes 1500 hour salt fog test! Dispenses with IES 300ml cartridge applicator guns #96212, #96215. INTER-SEAL Urethane Seamtape is a flexible self adhesive sealing material, designed to cover large-gap body seams. Designed to replace OEM sealing tape used by General Motors, Ford, Chrysler and various other late model passenger cars, vans and light duty trucks. Common applications; OEM trunk lip seams, door edge, post and frame seams, rocker panel seams and tailgate frame seams. 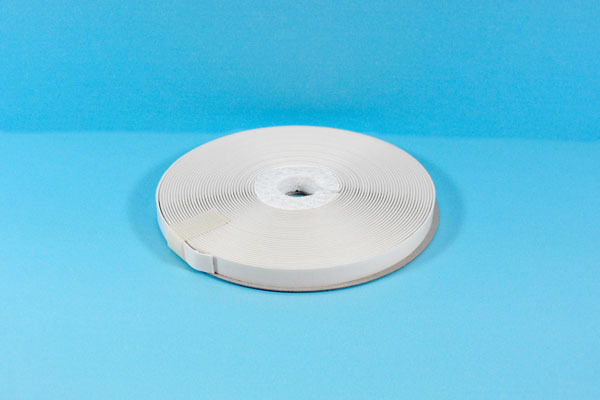 NTER-SEAL tape is 3/64" thick. 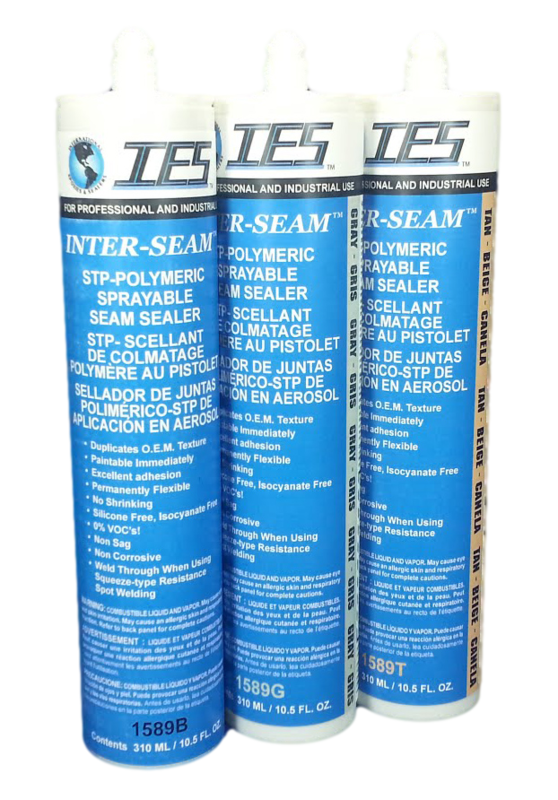 IES™ introduces a new line of Seam Sealant Tapes that provides an innovative solution to the problem of applying sealants. NU-SEAM™ Sealant Tape quickly duplicates the factory appearance, is immediately paintable, and has excellent adhesion. A self leveling seam sealer designed for sealing roof seams and drip rails on Ford F-Series Pickups, van's, SUV's and various other horizontal applications. Excellent adhesion to: bare metal, primed metal, SMC, FRP, fiberglass, aluminum and most plastics (for TPO and Polypropylene plastics, use #4182 INTER-BOND Adhesion Promoter). Our automatic mixing system eliminates errors which are common in manual mixing. Dispenses with any IES 300mL cartridge applicator gun. WORKING TIME: 20 - 30 MIN. HANDLING TIME: 30 - 45 MIN. A non-sagging, firm, semi-flexible adhesive/sealant used for sealing vertical and horizontal seams and joints on automobiles and trucks. Can be used to reinforce and eliminate flutter and vibration of body panel cross members. Excellent adhesion to: bare metal, primed metal, SMC, FRP, fiberglass, aluminum and most plastics (for TPO and Polypropylene plastics, use #4182 INTER-BOND Adhesion Promoter). Our automatic mixing system eliminates errors which are common in manual mixing. Dispenses with IES 300mL cartridge applicator guns #96212, #96215. SANDABLE TIME: 20 - 30 MIN. PAINTABLE TIME: 20 - 30 MIN. HANDLING TIME: 10 - 20 MIN. A non-sagging, firm, extremely flexible adhesive/sealant used for sealing vertical and horizontal seams and joints on automobiles and trucks. Can be used to reinforce and eliminate flutter and vibration of body panel cross members. Excellent for pickup beds and around hinges. Excellent adhesion to: bare metal, primed metal, SMC, FRP, fiberglass, aluminum and most plastics (for TPO and Polypropylene plastics, use #4182 INTER-BOND Adhesion Promoter). Our automatic mixing system eliminates errors which are common in manual mixing. Dispenses with IES cartridge applicator guns #96200, #96216, #96212, #96215. Dispenses with IES cartridge applicator guns #96200, #96216, #96212, #96215. A non-sagging, firm, semi-flexible adhesive/sealant used for sealing vertical and horizontal seams and joints on automobiles and trucks. Can be used to reinforce and eliminate flutter and vibration of body panel cross members. Excellent adhesion to: bare metal, primed metal, SMC, FRP, fiberglass, aluminum and most plastics (for TPO and Polypropylene plastics, use #4182 INTER-BOND Adhesion Promoter). Our automatic mixing system eliminates errors which are common in manual mixing. Dispenses with IES cartridge applicator guns #96200, #96216, #96212, #96215. INTER-MIX 20 is a 1:1 methacrylate structural adhesive formulated to bond engineered thermoplastics, thermosets, composites and metal structural elements together in any combination. INTER-MIX 20 forms a tough, high-strength, high impact resistant bonds. It features a medium cure time for flexibility in positioning and multiple operations, but provides for faster fixturing. INTER-MIX 20 has outstanding durability and environmental resistance to most common industrial cleaners, fuels, lubricants and environmental conditions. This product is formulated as a non-sag, creamy gel to dispense through static mixer tubes and bulk dispensing equipment. Contains glass beads to prevent adhesive squeeze-out. Tremendous impact resistance. CAUTION: ADHESIVE IS FLAMMABLE when in a liquid state. Allow adhesive to set before welding (approximately 1-1/2 to 2-1/2 hours). Keep any welding to a minimum of two inches from the adhesive. Adhesive is combustible when cured and will burn. Refer to Safety Data Sheet. Ideal for bonding all types of metal, PVC, Fiberglass, PBT, PPO, ABS, FRT, Polyurethane, Epoxy, Wood, RIM, Nylon, Polyesters, Acrylics, Gelcoats, Styrene, Aluminum, Stainless Steel, Cold Rolled Steel, etc. Ideal for Automotive Components, Marine Assemblies, Electronics Enclosures,Appliances, Aerospace Parts, Electrical Components, Furniture, Windmill Assemblies, Exterior Sign and Displays, Plastic & Metal Fabrication, etc.